It has been said that one learns more from his failures than his successes. Undeterred by my prior washouts, I vowed to improve my RC skills although those little green demons of haste and impatience continued to hound me. At some point, I acquired a Pronto kit designed by Dave Robelen. It was a cute little low-wing sport machine that reminded me of the PT-19, especially in Robelen’s original, yellow and blue between-the-wars color scheme. As soon as the kit was in my possession, I had to start building! In retrospect, I have come to the conclusion that all projects have an appropriate pace. That pace may be different for each individual modeler and each individual project but there is certainly a proper speed with which one should proceed. This ideal pace is the perfect balance of progress and sound decision-making. Work too slow; you succumb to every pitfall and never finish the project. Work too fast; you make rash decisions that doom the project to eventual failure. At the time in my life that I built the Pronto, I had not yet had this revelation. Instead of carefully studying the plans and building instructions to make sure I understood every step, I simply bulled through the build trying to get things done ASAP. Around this same time I also got quite familiar with another factor of modeling which demands recognition; the modeling budget. Rushing through the building process is certainly one way to make sure things get done wrong, but also not realizing that a project is beyond monetary capabilities can lead to just as many mistakes. 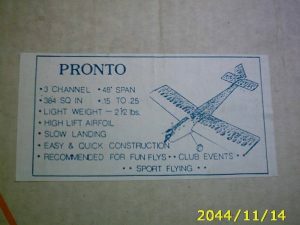 The original kit box label for the Pronto. At some point in the project, I ran out of epoxy. All my greenbacks had flown the coup, so I substituted. Surely other glues would be sufficient for things like wing spar joinery… I can’t recall which glue I substituted for the correct one, but that point, my friends, is now moot. Additionally, I could not afford the Monokote that should have been used to cover the Pronto. Instead, I had inherited an old roll of iron-on fabric covering that my grandfather had collecting cobwebs in his shop. I decided to use this instead. I quickly learned why this stuff had never been used. It was quite heavy and did not stick well to the framework. Luckily the Pronto had no compound curves because I am sure this mystery fabric would not have conformed to them at all. The covering looked, as Dave Platt might say, “Like a pig’s breakfast”, but there was the Pronto, ready to fly in record time. I could not wait to test-fly this thing. 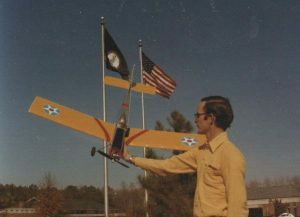 My friend Chris was always semi-interested in my aeronautical exploits and decided to come along for the maiden flight. My flying field, prophetically, was at the edge of a cemetery. 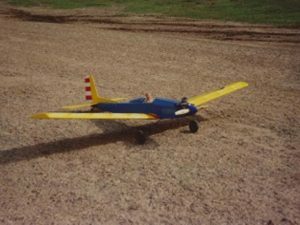 It had a nice open field and a paved strip that could be used as a runway, and the neighbors were quiet. I quickly assembled the model and filled the tank. I rushed through the pre-flight check, failing to check the center of gravity, thinking forward about how great this plane was going to fly. I started the trusty O.S. .15 and set the needle. I did manage to check the controls, and then goosed the throttle. The Pronto lept into the air after a 10 foot rollout and was climbing at about a 45 degree angle! I quickly gave down elevator and managed to keep it from stalling. I hurriedly fed in full down-trim but could not keep the nose level without massive amounts of down-elevator. 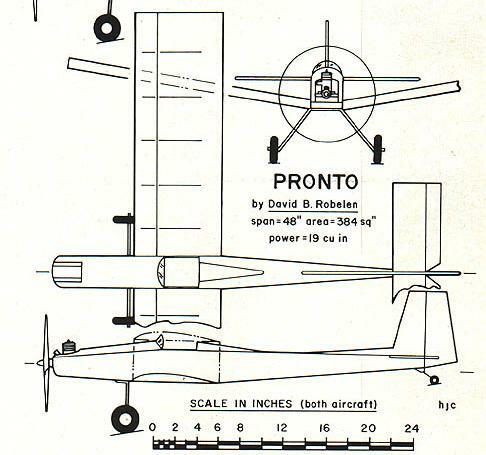 The Pronto was barely controllable, intermittently climbing and diving at 45-degree angles. I did manage to avoid the trees at the end of the field but couldn’t wrangle my horribly tail-heavy machine into any semblance of a controlled flight pattern. Never substitute when you know consciously that you are using the wrong glue! The full size plans as downloaded from outerzone.com.